Steve Bulmer has lost his long 6 year battle with cancer. 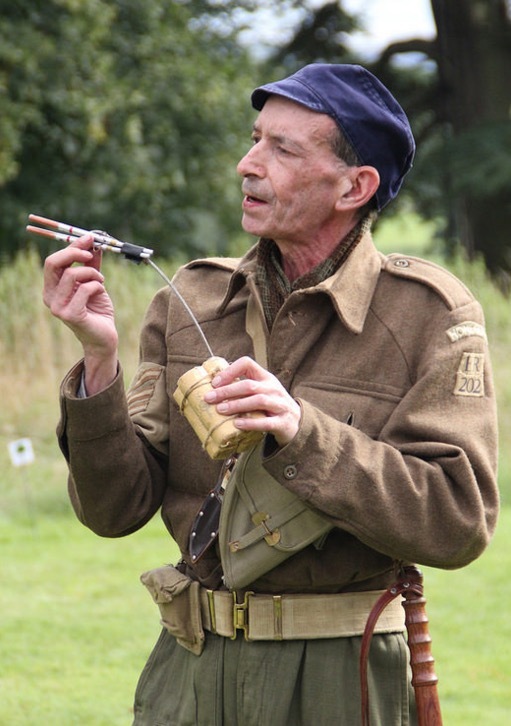 Steve was an excellent Auxiliary Unit Re-enactor with the Pontefract Home Guard Living History Group who attended at least two events at GHQ Coleshill and was a respected gentlemen. He will be missed by the Aux community. He has been a member of the Pontefract Home Guard for 13 years. As long as we have known him he has had a great interest in the Home Guard Auxiliary units, equipment and methods that they used. He has put on living history displays for the Home Guard, Home Guard Auxiliary and Bomb Disposal. He was an active member in the Territorial Army in the past, which gave him the knowledge to train the members in the correct military drill. Last year we attended the weekend display at Coleshill where he met Trevor Miners, one of the original members of the Auxiliary Units. He also visited the OB and related tales of past visits to Coleshill. After the visit to Coleshill we paid a visit to the old Post Office on our way home. The last event that he attended was the Pickering Wartime Weekend based at North Yorkshire Moors Railway at Goathland, one of his favourites. Thank you to May Benton, Pontefract Home Guard Treasurer for supplying the information. We met Steve at the last Coleshill 1940’s day. A very knowledgable and respected gentleman. R.I.P. Hope you are having many hours chatting about the Auxiliary units.